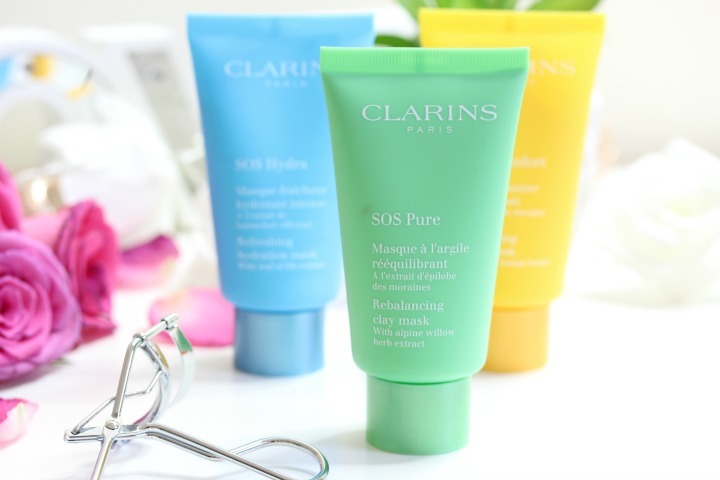 Clarins SOS Face Masks Review; The best Clay Mask ever?! Face masks are always hit or miss for me; I am obsessed with the idea of popping a mask on twice a week and letting all of the masky goodness sort my face out but in reality the time I actually spend with a face mask on is barely anything at all. I don’t know if it’s just me, but the idea of sitting and putting a face mask on really excites me but also really wares me down, questions like ‘do I have enough time?’ or ‘Can I actually be bothered?’ cross my mind and I never end up doing one until my face is in desperate need. The idea of face masks being quick and easy is not cemented in my head and yet that’s exactly what they are. 10 minutes on and a quick wash off and you’re good to go; so why don’t I do one more often? I guess the answer to that is that I haven’t really found one that wows me with it’s instant results. Leaving a clay mask on for ten minutes is great in reality but when you break out in spots the next day it all seems like it was for nothing. In actual fact that’s the complete opposite response you should be having because a good clear out of your skin is why the mask was a good idea and kept to a regular masking routine, you shouldn’t have the breakouts. 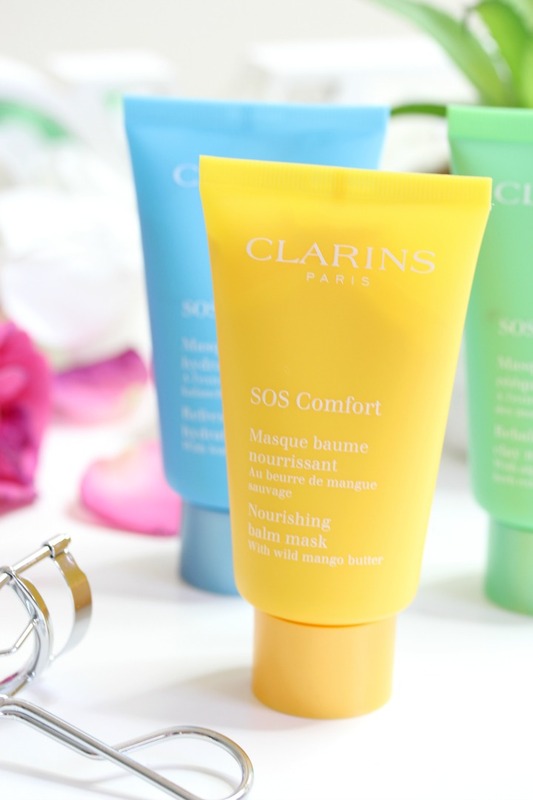 The new Clarins’ SOS face mask range is the perfect example of that. For the past few weeks I’ve been having a play around with the new Clarins SOS face masks and have come to the conclusion that I’m just lazy! With three different kinds of face masks for your different facial needs Clarins have really hit the nail on the head with these because they have cleared up my skin and made it appear more glowy and hydrated with just three simple steps. First up I wanted to talk to you about my personal favourite of the three; SOS Pure. SOS Pure is a green clay mask with alpine willow herb extract designed to leave your skin velvety soft after sorting your skins imperfections. Perfect for combination to oily skin (hiya) this rebalancing mask works to purify the skin without drying like other clay masks do. I’ve popped this mask on with a face mask brush (as to minimise product waste) for around the last two weeks every couple of days and have really liked the results. Of course, having not religiously masked for the past couple of months (if not longer) I had an initial break out of a couple of spots around my chin and nose area but after cleansing with my usual skincare routine and applying this mask again every couple of days the breakouts became less and less. Almost three weeks in my skin is now pretty clear and although a hormonal spot might appear every now and again (I am growing a human after all) I’m pretty chuffed with the results. SOS Pure has a really gorgeous fresh scent to it which instantly makes me feel calm and with it being so easy to apply and rinse off with cool water I genuinely think I’ve found my new favourite clay mask. I know you probably think this is me just babbling on but compared to my other fave clay masks that I continuously repurchase and apply every now and again (Origins Charocal Mask being one of them), I am obsessed with the fact that this one doesn’t dry onto my skin. Don’t get me wrong, I love a good skin-cracking drying clay mask as they really feel like they’re doing wonders, but one of the reasons I don’t reach for them too often is because they take a while to scrub off; this Clarins SOS Pure face mask is completely different to other clay masks I’ve tried and with a little cool water is so easily removed. It feels cool and light on my skin and the results really prove how much of a good job it does without having to pull my face apart by drying. It’s one I’ve reached for every single time I’ve wanted to mask over the past few weeks and I can guarantee it’ll be the one I keep reaching for too. 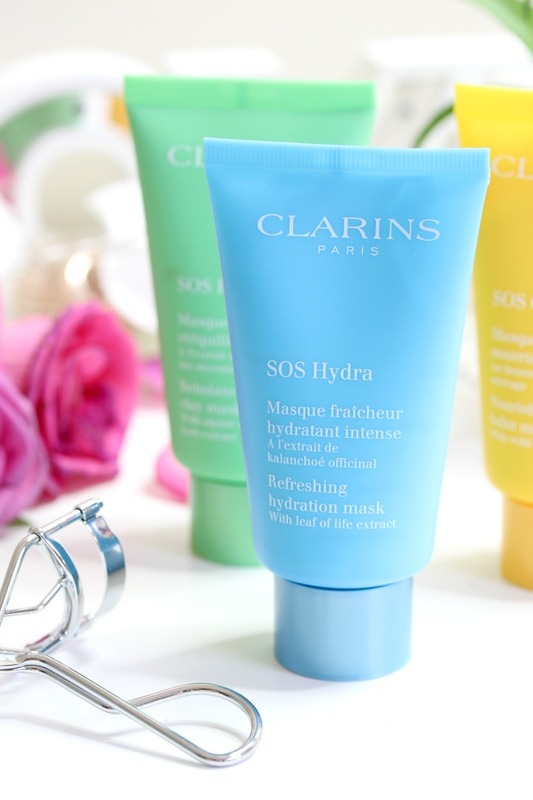 Clarins SOS Hydra is the next mask that’s recently been released and is 100% not the kind of face mask I’d usually go for. Being a mask-when-I-feel-like-it kinda gal, the masks I only every tend to reach for are clay masks that I really feel are grabbing the dirt from within. Hydrating and moisturising masks are really only something I’d choose to use if I’m having an especially dry skin day and even then I’d probably pick up a heavy duty moisturisers instead. The SOS Hydra refreshing mask is a mask designed for all skin types to re-boost the skins moisture with leaf of life extract and a hyaluronic acid complex. This mask has a cream/gel formula and smooths over the skin really easily to instantly hydrate your skin from the get-go. Once again, as with all of Clarins’ new face masks this one stays on your skin for ten minutes before you can wipe it off, but what I especially like about this one (and the SOS Comfort, which I’ll talk about in a second) is that you don’t remove it with water! I know, say what?! The SOS Hydra face mask is to be removed with a cotton pad and lotion and being me, I’m not entirely sure what is meant by lotion but I’ve been removing mine with a cotton pad and some of my favourite toner. It leaves my skin feeling super bouncy and hydrated and I don’t feel like I’ve washed away any of the goodness. I’ve been using this face mask after I’ve been using the SOS Pure clay mask either on the same day or on the day after, just to re-introduce the moisture into my skin and my skin has definitely been loving me for it! Last but by no means least in the trio of new Clarins SOS face masks is the SOS Comfort Nourishing balm mask which is designed for dry skin. As many misconceive, there is definitely a difference between dry skin and dehydrated skin and this mask is one for those who have dry and tight skin. Having never really tried a mask that is more of a balm than anything else, I was pretty excited to try this one out. Although my skin is combination most of the time I do get pretty dry skin more often than I’d like; using a lot of spot-banishing cleansers and skincare bits really does strip my skin of a lot of it’s natural moisture and so I usually have to slather my skin in moisturiser to try and get it back to life. That isn’t always that great of a solution though as it can take a lot of moisturiser to sort out my face and so an intensive balm mask to re-nourish my skin was exactly what I needed! I’d say of all three masks this would be the one I use the least as more of a treat for my skin as with using the SOS Hydra mask once a week and how my skin usually is, I wouldn’t really need to re-nourish it quite that often, but from using it so far, I can tell it’s the perfect mask for my skin on those really dry days! Again I removed this mask with a couple of cotton pads semi-soaked in toner and the feel of my face after was just gorgeous. It made it feel so much bouncier and full of life and definitely not dry which is a really great result for having it on for such a short period of time. My skin 100% felt more nourished and healthier and I really could feel the difference compared to the SOS Hydra mask. This one really does make your skin more comfortable and less dried out whereas the Hydra mask really gives your skin the extra re-hydration that it needs to keep it looking bouncy and healthy on a daily basis! At £30 for a 75ml tube, I’d say these masks are really well priced; They’re absolutely gorgeous and perfect for an array of different skin types and skin issues and last forever with how little you need each use. My skin has well and truly loved being pampered by these three and I will definitely repurchase any of them in a heart beat when I run out – especially the SOS Pure and Comfort. These are available now from Clarins. Will you be trying any of them? Next Post Nesting made easy; Why Milton have it sussed for Mum’s to be!